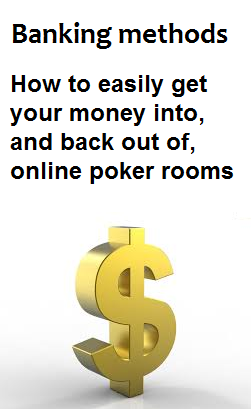 Some of the best ways to move your money into and out of online poker sites. There are many deposit options available to online poker players. Aside from the more traditional methods of moving into and out of your poker accounts, such as Visa and MasterCard credit cards, and of course bank transfers, there are other, more internet specific, payment processing methods known as ewallets, or digital wallets. For the purposes of this article, I am going to assume that most people that are of legal age to play poker online also know what a credit card is, and how to get one, so I don’t intend to give a lot of details about that particular payment processor option. But some of the newer online processor businesses might not be as well known to online players. These are the methods that I will focus on. Here we are going to look at the main electronic wallets that you will encounter online, and hopefully determine which ones are worth having. For a more indepth look at each of the available options, and to see which rooms have the lowest deposit limits for each of these payment methods, click through to the individual processor’s page. One of the first online payment processing businesses, Neteller has been around since the earliest days of the internet. They are a worldwide business now, with their corporate offices now based in the Isle of Man, near the U.K. As such they are regulated by the UK’s financial watchdog, the Financial Services Authority. As an e-money service, Neteller is not a bank, though you can get a MasterCad brand debit card from them. Once you create and verify an account with this company, you can use a variety of methods to deposit funds into your account. When funded your Neteller account can be used to transfer money quickly and easily to your chosen poker room or other online site. It is one of the most widely used ewallets, certainly in online gambling, and is supported by most poker rooms. Previously known as MoneyBookers, Skrill rebranded recently, presumably in an attempt to be more hip and current. Regardless of whether you like the new name or not, this ewallet business is the most used online wallet in internet gambling. It is supported by almost all online gambling sites that are not involved in the U.S.
Much like Neteller, once you set up and verify your account, transferring money to and from poker sites is quick and painless. Fees at this site are very low, too, so you can withdraw your funds to your bank account fairly rapidly and cheaply. They too have an option for their memebrs to get a MasterCard debit card for easily accessing your online funds. Between Neteller and Skrill, you will be covered at most online gambling sites that you want to play in. The service from PaySafeCard is not like Neteller or Skrill. Instead it is more like a voucher system, where you buy the PaySafeCard offline in a shop or other outlet, and then use that voucher to deposit online. Primarily used outside of gambling, it is being supported by more and more poker sites, and the number of countries where you can buy these cards is also growing. When you purchase one of these cards you will get a four digit PIN number that you use to transfer the funds on the card to a gaming site. You can check the balance on your card by going to the PaySafeCard website and entering the PIN number there. You can also deposit funds to your Skrill account using one of these cards. Paypal is possibly the oldest online payment processor and is most certainly the biggest one. However, they have only recently started allowing their customers to use their Paypal accounts to make online gambling transactions. Many poker rooms do support this option. It should be noted that Paypal have a terrible reputation for poor customer service. They can be arbitrary in closing accounts, and once they decide to do that for whatever reason, they will not change their minds. Paypal can be a useful option for online gamblers, but you should never leave any unneeded funds in your account. They operate much the same way as both Neteller and Skrill. This is another voucher system, where you buy the credit in whatever amount you need in a real world shop or outlet, and then use the voucher you get to transfer the funds online. Again you can check the balance online of any voucher you have. You can withdraw funds from your poker account back to a voucher, or have a new voucher issued by the poker site for the value of your withdrawal. This is another online payment company that is continuing to gain in popularity, usage, and support by the various gaming sites. Unlike the other methods listed here, EntroPay is a provider of virtual debit cards. You will need to create an account online and fund it with a bank transfer. After that you get a virtual debit card that can be used anywhere Visa or MasterCard is accepted, which is pretty much everywhere. This is a good service, and is widely accepted in the online gambling world, but virtual debit cards are easy to get. While useful, there are no real extra benefits to this service over any other virtual, or real, debit card. Of course you know how to get a credit card. Either of these can be used to deposit to a poker room, though many players have difficulty trying to use MasterCard for some reason. And while Visa credit cards work fine for both deposits and withdrawals, MasterCard is never allowed for making withdrawals. This is oresumably a restriction imposed by MasterCard themsleves. Do bear in mind that you will need a second payment method for receiving your winnings if you choose to deposit by MasterCard. Most of these options will be of no use to players from America. Neteller does not even offer it’s services to Americans, and Skrill may stop supporting that country soo, too. Paypal of course is available to U.S.A. citizens, but not for gambling tranactions. Don’t even try it. The only option from this list for US players would be Visa card, either debit or credit. Even then, you may run into trouble. You will need to have your card authorized for international transactions if you choose to use it. You can get that done by contacting your issuing bank. If they cannot, or will not do that for you, then you can try purchasing a prepaid Visa card either online or offline.